I was walking along the corridor on level 5 of Queensland Museum last week, pondering the topic of my blog post for this week. I passed by the doorway to our conservation area and saw some very old microscopes. This prompted me to think about how microscopes have developed through time. In 1590 two Dutch eye-glass makers, Zaccharias Janssen and son Hans experimented with multiple lenses placed in a tube. In 1665 English physicist, Robert Hooke looked at slices of cork through a microscope lens and noticed small “cells” in them. However, it wasn’t until 1674 that Dutchman Anthony van Leeuwenhoek built the first simple microscope. Leeuwenhoek had no formal training in science but was passionately interested in lens grinding as a hobby. 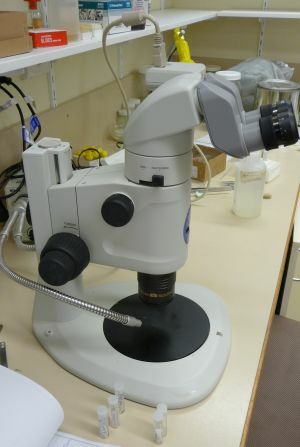 He started using his lenses as microscopes – just a single, very small lens in a suitable holder –a bit more simplistic than the early microscope shown below. These lenses could magnify up to 270 diameters and achieve sufficient resolving power to reveal quite a lot of detail. One day when viewing a drop of rainwater that had been standing in a tub for several days, Leeuwenhoek came across what he described as ‘little animals’. He wrote up his findings in 1677 and so ‘microbe hunting’ changed from a hobby into a serious scientific pursuit. 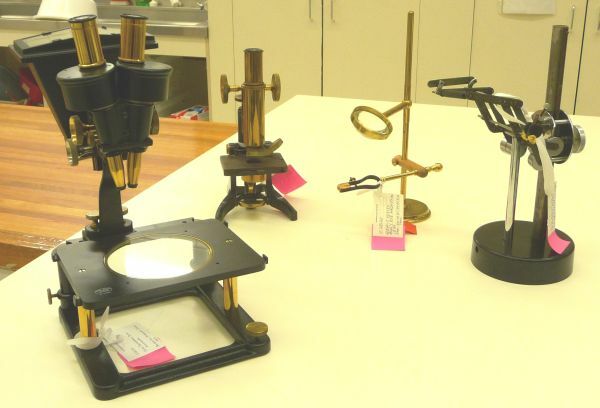 Microscopes have changed a lot over time. Some examples of earlier models from our QM collection are shown below. 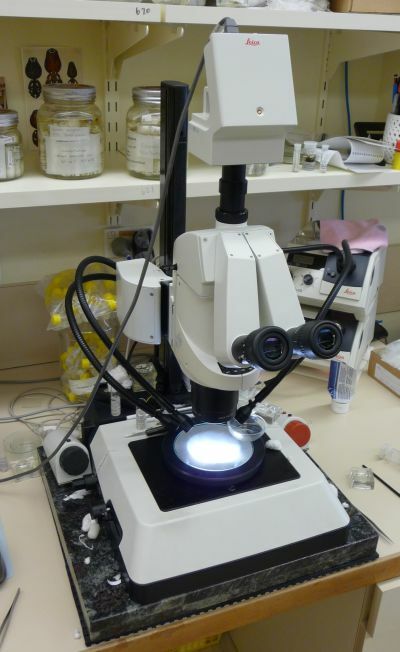 At QM powerful stereomicroscopes are used for viewing small insects and spiders. Some examples from our entomology and arachnology labs are below. Technology has developed to the extentthat we now have the capability of zooming in on extremely small details of specimens. See an earlier blog post about New Age Technology – Digital Imaging. Three-dimensional images show great detail about the surface structure of specimens. This can be achieved with the SEM (Scanning Electron Microscope) which can magnify from 20x – 500,000x with spatial resolution of 50 – 100nm. (A nanometre is one billionth of a metre or one millionth of a millimetre.) This is about 250 times the magnification capability of the best light microscope. With the TEM (Transmission Electron Microscope) a beam of electrons is transmitted through an ultra-thin specimen. Electron microscopes have given us much greater magnification power and resolving ability over normal compound light microscopes. 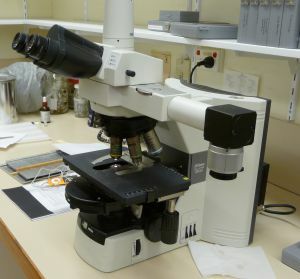 High-powered microscopes connected to computers are often used to capture digital images of specimens, take measurements, and insert specific details into journal articles. Research officer, Dr Terry Miller is investigating trematodes in fish that inhabit the reefs of north Queensland. Trematodes are parasitic flatworms or flukes of the subclass Digenea, which belong in the phylum Platyhelminthes. The adult form is primarily found in the intestines and stomach of their final fish host. The flukes are characterised by: a pair of suckers, one near the mouth and one on the ventral surface; complex life cycles involving intermediate hosts; male and female reproductive organs in the one individual (hermaphroditism); and a very high reproductive rate. 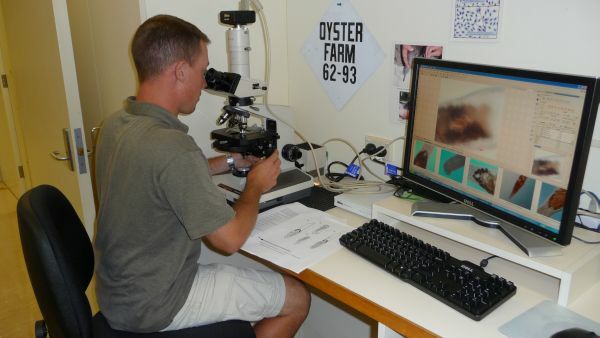 Terry is currently researching a species of Trematode from the Family Bucephalidae, which parasitises marine fishes. 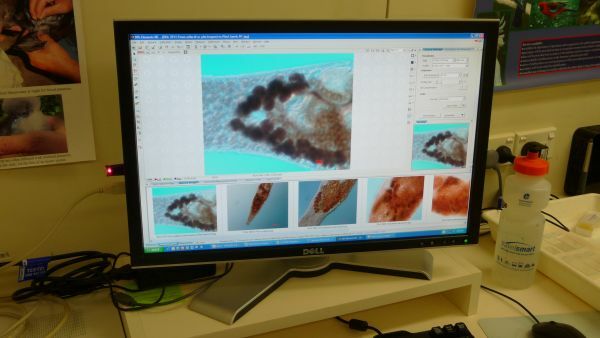 In the images below, Terry is viewing some images of the worm under a stereomicroscope that is connected to a computer. The images can then me analysed on the computer and data and measurements recorded. As well as assisting in taxonomy and research, microscopes have revolutionised the world of medical science. They have helped in pathology – disease diagnosis and biopsies- and in diverse fields such as Genetics, Microbiology, Biotechnology as well as Geology and Forensic science. We owe a lot to Leeuwenhoek’s hobby of lens grinding back in the 17th century.